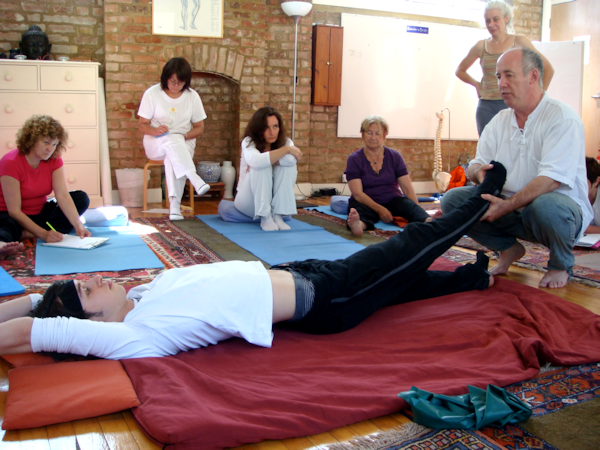 When you think about Shiatsu in England, two names immediately come to mind: the East-West Center and Bill Palmer. 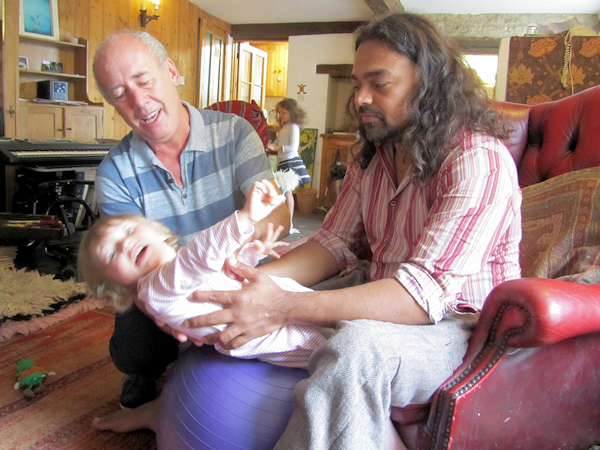 It is this giant of English Shiatsu that we have the great pleasure to present you: longtime teacher, co-founder of U.K. Shiatsu Society and a passionate and tireless researcher on children’s development. Bill Palmer gives us here a large part of the history of Shiatsu in the United Kingdom and the exciting results of this research on children. Ivan Bel: Hello Mr Palmer. My first question is how and when did you discover shiatsu ? In 1973 I started practicing Aikido when I was at university. 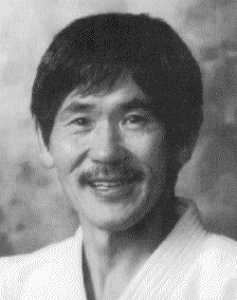 My teacher was also a very good shiatsu practitioner, his name was Minoru Kanetsuka, and I llked what he did. So I started to learn from him. For six years I followed him, looking at what he was doing, then at the dojo people asked me to do some treatments. So my beginnings are very bound to aikido and the dojo spirit. It was a very simple form of shiatsu, no meridians at all. Was it like the basics in Namikoshi style of shiatsu? No, in fact it was before that, a simpler way of practicing. It was based on key points and the quality of the touch. My teacher used to say: “shiatsu is like aikido. Don’t try to control anything. Just improve your quality of touch and to respond to what you feel” or “if you have an open heart, you can accept anybody with no harm”. So what I learnt with him was to trust what I feel, not to think about what I should do. And after these years of introduction, did you follow your path into shiatsu? es indeed! In 1978 I started to learn more shiatsu with Akinobu Kishi. At that time he was still a Zen shiatsu teacher in Paris. With him I acquired more knowledge with meridians and advanced theory, but I never really made it to diagnosis. It was more feeling the contact, keeping in touch with the body. Since that time I never really liked diagnosis, because it’s an expert process where the client is left out. S/He doesn’t have a clue about what’s going on. 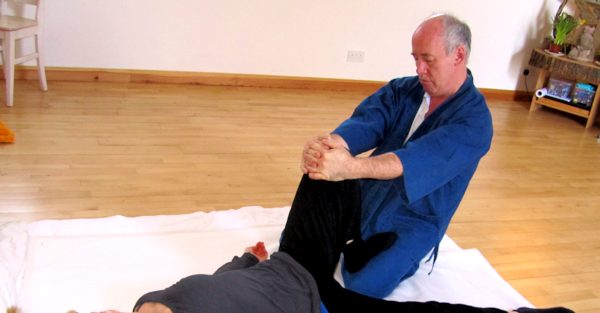 But he feels the contact and we can feel the energy, so it’s a perfect common point from where we can start shiatsu. Did you travel to Paris to study with Kishi? Only once, then in England. There, I attended several courses where Kishi and other teachers who were invited to London. I did all my studies in London. So after this period did you start working as a professional? Not yet. At that time there were not really any shiatsu professionals. It was all very new! We were perhaps less than ten practitioners in all London. So most of us met weekly and we taught each other what we knew. In this group there were only people who had studied directly with Japanese teachers. Michael Rose had studied with Masunaga, Carola Beresford-Cooke with Ohashi and Harriet Devlin with Kishi. For their part, Merle Gering had studied acupressure and Neil Gulliver the Macrobiotic Shiatsu. So we were a broad-spectrum group, so to speak, whose purpose was to share our knowledge. After a while, Michael, Harriet and I formed study groups for those interested, but we had no plans to create a profession. And that was the beginning of the U.K. Shiatsu Society, right? YYes, indeed. In December 1980, we celebrated Christmas at the October Gallery in London, and all students in our classes and those in the East-West Center were invited. There, the students told us “we want you, the teachers, to form a Shiatsu Club, where we can meet and exchange“. It was not a matter of professionalism, we did not think about it, but just a way to practice and work together. Thus, the following year we created the U.K. Shiatsu Society, which quickly became a professional association. Schools started to offer extensive training and the club became an organization charged with maintaining the quality of the courses and supporting the training. When did you start working with shiatsu? Well, in the 70s I used to do some research in theoretical physics at the university. One day I looked at people around me and thought, “I do not want to end up like them” (laughs). I became more and more autistic, still locked in my head, and realized that I needed to be more with people than with ideas. So, I left the academic life and I worked in a theater school in London called Central School of Speech and Drama (trad: central school of speech and theater). It was at this school that I really started working with shiatsu, even though it was not the job I was paid for. The students got injured quite often in class and asked me to help them. So, I had at least a dozen people a day for shiatsu, in small sessions of 20 minutes. Later, they asked me to teach shiatsu in this school. I had been there for 5 years and I developed a new Shiatsu style, named “Shiatsu Movement”. Then, after a few months trip to Japan, I opened my own school. It was 30 years ago! “Shiatsu Movement” developed from the principles I learned from Aikido, but especially from a long period of working with children with disabilities. Working with these children, I noticed that they were “dispossessed of their minds” by the therapies they received. Children with disabilities were mainly treated by physiotherapy, which wanted to make their body as “normal” as possible. But the only result was that children felt that something was basically wrong with them, as a person. As for me, I thought that everyone, not just children, needs to feel good and whole. Only then can they explore the areas where they have problems without losing their bearings. I started working with these kids first and foremost on everything they could do easily, rather than focusing on their problems. It was a real success! The sessions brought them (and me too) a lot of joy and care. And from this joy and care, they found the courage to work on areas of their bodies that were more difficult to access. Then I thought about doing the same thing with adults. People usually focus on what is wrong with them, instead of what is good in them. That’s why the basis of “Shiatsu Movement” is to explore the client’s ability rather than their incapacity. This helps the client explore himself as he is and cherish that. And only after this step, do we explore how to work on problem areas. It’s a complete change of view, because you see things the other way around. Does that mean you’re working only with body movements or do you also use meridians? This is a very relevant question. To answer it, I must first explain how I see the meridians, a vision that I learned from working on babies. Babies learn to move by assimilating reflex movements. And the way in which these reflexes finally form the movements of the whole body follows the path of classical meridians, and in a very precise way. It’s as if the meridians formed an innate map that shows the brain how to reunite and use the body with movements. This connection between the movements and the meridians is much more precise than the metaphor on the Masunaga amoeba. It is possible to trace the muscle chains that create movements like crawling or rolling. However, these muscle chains follow exactly the meridians. It was an exciting discovery, but there was an even deeper aspect. I was very excited by these observations, discovering that babies are learning movements through the meridians and that the energetic talents that a baby discovers through these movements correspond to the movements of the Qi of the meridians. It was a satisfying explanation of the meridians. Also, by “working with the meridians”, I mean “process of body development from which you can rediscover the energy functions that have been lost or damaged”. In the 80s, there was a lot of research on child development that showed that babies develop their personality through the way they learn to move. For example, the way of crawling reflects their excitement in action: if they are attracted by a distant object, they begin to crawl to reach the object of their desire and obtain satisfaction. But in the act of crawling, the muscles that align the body to allow it to advance straight ahead exactly follow the meridian of the Bladder and the Small Intestine. Together they form the Taiyang meridian. Now, think about what the child learns from this movement; he learns that he can act on his desires, obtain satisfaction by himself through the movement and direct his will to achieve what he wants. That’s exactly what it’s all about when you talk about Taiyang Qi – aligning action with intention and choosing what you really want. In other words, it helps develop a clear and precise will. I was very excited by these observations, discovering that babies learn movements through the meridians and that the energetic talents that a baby discovers through these movements correspond to the movements of the Qi of the meridians. It was a satisfying explanation of the meridians. Therefore, by “working with the meridians”, I mean “process of body development through which you can rediscover the energy functions that have been lost or damaged”. It’s quite impressive! How long did it take you to discover this? It took me ten years of research with babies, to film them and analyze their development before showing that this link with the 12 meridians really existed. When you speak of meridians, are those we learn in the West (Bladder, Stomach, etc. ), or the classical meridians that we study in Asia as Taiyang, Shaoyang, Yangming, etc.? The development of the body tends to show that these are classical meridians such as Taiyang (Bladder – Small Intestine) or Yangming (Stomach – Large Intestine). The body skills learned through movement and through ancient meridians show that there is always a mixture of the Qi of a meridian of the arm and that of a meridian of the leg, which in the end form an extended meridian. Do you think that these movements can also be explained using the tendino-muscular meridians? The muscle chains drawn by the tendino-muscular meridians have of course functions, but in many cases they do not correspond with the developmental pattern of the baby. The classic meridians are the ones that follow exactly the development process. However, they are only innate connections of the body at the stage of the first movements. When the child really learns to control his body in motion, to develop a certain elegance of gesture or athletic ability, the movements cross the center line of the body and form spiral connections across the body. No classic meridian does that. Also, I think we are creating new meridians (perhaps even meridians that are personal, unique to each individual) as we develop new motor abilities. Much of my work focuses on helping people find their meridians, which are not only muscle-related, but elastic connections to fasciae. Do you still practice with kids today? es, yes! Not as much as I used to, because I mainly teach now. But when I work with them, I still discover an enormous lot because I’ve got a great connection with children. You know, when I was born, I had cerebral palsy which I completely recovered from. But there’s something about having this experience that the babies understand. So there’s a really nice mutual understanding with babies. In fact, I love working with them. That’s fantastic! Can you tell me why at one point you started to make videos with babies, and why it was important in your work? Oh ! In the early 80’s, I worked with Kay Coombes who was a language therapist, trained in Bobath physiotherapy [i]. She specialized in babies with cerebral palsy and other developmental problems. I was filming it while it stimulated the nutritive reflexes by touching all around the mouth. I noticed then that the effects of the stimulation traveled much further, down the body, following the line of the Stomach meridian. In fact, she was touching St.4 which is supposed to be a reflex in the head. This was the case, but there was also a reflex in the lower body. It went completely against what science thought at the time. Science said that by touching an area near the mouth, the mouth would react and that was true. But no one expected another reflex to appear lower in the leg or foot. This was the first clue that allowed me to understand the connection between reflexes and meridians. We did this again and again on several sessions then with more and more children, and it worked systematically. The meridian of the Stomach was the first that I studied in this way. Oh! In the early 80’s, I worked with Kay Coombes who was a language therapist, trained in Bobath physiotherapy [i]. She specialized in babies with cerebral palsy and other developmental problems. I filmed her while she stimulated the nutritive reflexes by touching all around the mouth. I noticed then that the effects of the stimulation traveled much further, down the body, following the line of the Stomach meridian. In fact, she was touching St.4 which is supposed to be a reflex in the head. This was the case, but there was also a reflex in the lower body. It went completely against what science thought at the time. Science said that by touching an area near the mouth, the mouth would react and that was true. But no one expected another reflex to appear lower in the leg or foot. This was the first clue that allowed me to understand the connection between reflexes and meridians. We did this again and again in several sessions, then with more and more children, and it worked systematically. The meridian of the Stomach was the first that I studied in this way. But what is interesting Ivan, is that it’s not related to the Stomach meridian only, but to the Yang Ming. You can’t separate the Stomach and Large intestine meridians. So, first it was experiences, and then the theory. Did you ever write a book about that? It’s a very good question! (Laughs). I’ve been trying to write a book for the past 15 years now. Every time I’m close to finishing it, I find new material, or discover something new or more accurate. If you’re interested in my research, there are already a lot of articles on my website, but you’ll have to wait a bit more for the book. [i] The Concept BOBATH or NDT BOBATH CONCEPT (Neuro-Developmental Treatment “Bobath Concept) is a concept of rehabilitation developed in the 1940s thanks to the work and research of Mrs. Berta BOBATH (1907-1991), physiotherapist and her husband the Dr. Karel BOBATH (1906-1991), neurologist. Today, the NDT Bobath Concept is a way of thinking and caring for babies, children, teens and adults with cerebral palsy (or Cerebral Palsy) and other neuro-motor development disorders.